It was another glorious day in FNQ. The temperature was perfect and the humidity virtually zero. I rose a little later than I’d planned and went for breakfast across the road at this lovely little restaurant with a Scottish name, which happened to also have a drive thru. As I munched on my hash brown and English muffin I got the strange feeling I’d been here before. Which is certainly not the feeling I’ve got from driving around FNQ in the last couple of days. It really feels like a different place up here. The light is different. The vegetation is different. The people speak differently. For example while folks down south might say “really?” when someone tells them something unbelievable or fascinating, up here they say “true?” However it kind of sounds like they are saying “correct”, i.e. sans question mark. It throws you when you hear it for the first time, like you’ve answered their question or something, when in fact you were telling them something fascinating or unbelievable, which I have been doing a lot lately. Especially for example when I tell them about the McScottish restaurant in town. I returned to the motel to plan my day. I have to say that I love motels. There is something really nostalgic about them, and something attractively tacky. I did some research recently about what distinguishes a motel from a hotel. I wanted to see if the definition might illuminate my attraction to them. Something besides the fact that they seem to have blended the words motor and hotel. The main thing, I discovered, is that a motel room opens directly to the outside world whereas a hotel room opens to a space within the confines of the hotel. One must access a hotel lobby or some such thing in order to access a hotel room. Not so with the motel. This didn’t solve the mystery of my attraction, so I guess it must have simply been the car/hotel word thing. Planning my driving route was fairly simple. I basically chose the only farmer that I’d had contact with and headed to him hoping that he would send me on to the next farmer and so on and so forth. This did in fact occur but not immediately. My meeting with Stevo had me peaking a bit early, making me perhaps a little delusional about how easy it would be to roll up to a farm as a fruit carton collector, earn trust, and engage in meaningful conversation with them about what they do. Noel Stevenson (Stevo) obliged though. Stevo’s Super Bananas is absolutely one of the very best cartons in my collection. It has a number of factors that I find appealing in a fruit carton: big text (twice reinforced), limited colour palette, symmetry, and anthropomorphic characters. It has IMPACT! Stevo’s farm is set in a beautiful location but there is no reference to the landscape in the artwork on the carton. Instead it embraces the habit of Australians to abbreviate names, and Stevo is a great shortening because like all great abbreviations it includes a vowel not previously in the name. I like this because it kind of tells you what sort of bloke Stevo is: he is indeed a fairly laid back guy. And laconic. Stevo has broadened the scope of his operation to include the growing of papaya and cocoa. They are ‘super’ as well. From the cocoa he makes his own chocolate, and from the papaya and banana he also makes dried fruits. At the front of his farm there is one of the most advanced roadside fruit stalls I’ve ever encountered. It has a refrigerated vending machine with all of the assorted goodies, in addition to the self-serve bananas and scales. After buying some of Stevo’s chocolate I proceeded southwards towards South Johnstone. I knew what to look out for at this point: banana plantations (obviously) and there packing sheds. It was some time before I found one but it was as good one, as I didn’t have its carton in my collection. I pulled over on the side of the road opposite and approached a woman, wondering to myself what she saw in the pasty white, obviously-not-a-farmer bloke walking over to her. It is always a question in these circumstances of what proximity one should start talking. I was yelling when I started talking, which gives you some idea of how far away I was. Needless to say she made me repeat myself. “Why are you collecting fruit carton lids?” It was pretty much the first question everyone asked me. I learned the best answer to this question was “for the hell of it”. It seemed to be the most satisfactorily received response. Sonia (or it could have been Sonya) gave me her Spiteri Farming banana carton lid. Like Stevo’s it is simple, bold, and strong. Similarly coloured too. Sonia told me that her family had come from Italy to Coff’s Harbour, to Sydney and then to FNQ. She told me a whole heap of directions but I am hopeless at listening to people when they tell me how to get somewhere, and I think she could tell because she told me the same thing about three times: it was best to keep heading in the direction I was, and to look for bloke called Robbo, who is a bit of a local identity (that’s the abbreviated version). I didn’t find Robbo but I met his daughter and her husband. They were packing bananas when I got there and were friendly and helpful. I’d just missed Robbo. 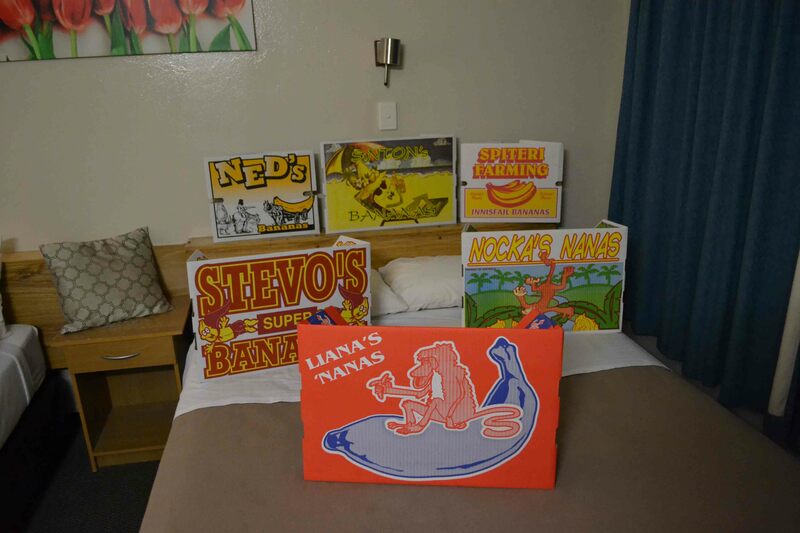 They gave me Liana’s Nanas carton on her behalf as they shared the packing shed with her. They used generic boxes to pack their stuff. They told me to keep heading south through to Silkwood and that I might encounter a few “Indians” making me momentarily think that I had been transported to the wild west. They meant farmers with Indian heritage, of course, but I didn’t find any except for one family who also used a generic box, as their usual one was getting re-printed. I didn’t get their names unfortunately, but I don’t think they quite understood the project, which doesn’t surprise me given I’m still trying to figure it out. From there I went in search of a farm that I’d called earlier in the day. It was interesting when I arrived because there was all these cars around the farm but there were no people anywhere to be found. I hung around for a little while longer but to no avail. There is only so much cautious walking and calling out that one can do before futility can no longer be denied. So I headed to the next town, called South Johnstone. It was time for lunch so the sole cafe in town, Off the Rails Cafe and Gallery, seemed like the most appropriate place to head. It was a pleasant encounter indeed! I had the most delicious feta and salad sandwich and found an enthusiastic audience for the Cartonography project in the proprietors, Cathy and her husband. They made a few phone calls but nothing came to fruition until after I’d left and Cathy sent me a Facebook message (we had ‘liked’ each other’s page earlier in the cafe) telling me that she had made contact with a woman called Sandra Sala who had a carton for me. I called Sandra and she was heading to the pub for about 5pm and could meet me at the cafe. Sandra intrigued me with the name of her carton; Knockers Nanas. In the meantime I was heading over to Martyville to see Bill Sinton as he had called earlier in the cafe. Bill was dubious on the phone, but he agreed to receive me so I had to give him some credit. I headed over there wondering if I was heading in the right direction. The phone line had been terrible and there were some crucial route details that may have been confused. A bit of laptop research in the boot of the car resolved the issues and I eventually figured it out. When I arrived Bill was sitting on the rather impressive steps to his Queenslander home with his son and his wife. He welcomed me and we talked very casually about the project and they seemed amused by my regular frustrated attempts to find farmers on their farms. Bill struck me as a very insightful person – he seemed to possess a certain wisdom and was very generous with his time and knowledge. I commented on his new house and he said the previous one had been destroyed by cyclone Larry. They marked time up here, he said, according to the “major weather events”, which made him smile – I think he realised the dark humour in it as he was saying it. I asked him if I could take a walk through his plantation and he seemed very pleased that I’d asked. “Find the irrigation and walk there; it will be cooler”. Sound advice. I could have hung around with Bill for a lot longer as he struck me as the kind of bloke who had a lot of sound advice. Walking through the plantation was truly amazing. I’d only driven alongside these vast tracts of banana trees and hadn’t given much consideration to what it would be like to walk amongst them. With the irrigation sputtering away the rows of trees were like their own little micro climate. It was a different quality of air in there and I cold have spent much more time weaving my way through. But I had to get and see Sandra back in South Johnstone. It was Nocka’s Nanas – not Knockers as I had thought from our brief conversation on the phone. It’s short for Enoch Sala, her father. Sandra’s family were from Spain originally. We had a great chat there on the main drag of South Johnstone and among many things she explained the design of the fruit carton had the Johnstone river running through it, just as their property did. Nocka’s Nanas is one of my new favourites, and not because Sandra had such enthusiasm for the project. I asked her to speak to her father so that we could talk on the phone in the coming weeks about their family’s history and experiences coming to FNQ. She liked the idea, so perhaps this will be the first of many ‘profiles’ on Cartonographer! As I was leaving South Johnstone I got a call from Sandra telling me that I should head back to Innisfail via Boogan Road, as there is a bloke there called Ned Di Salvo that has a Ned Kelly on his fruit carton. I was pretty satisfied with my day’s work at that point and thought I’ll head that way and if I encounter him then I’ll stop but otherwise… As I was driving past the point where Sandra had roughly told me he lived I spotted a bloke tending to an irrigation filter. I kept driving but after about 500 metres I slowed and decided to turn around and go back and ask if he knew Ned. When I pulled up I asked him “You’re Ned, aren’t you?” And sure enough he was. Ned was the perfect person to encounter to end the day’s search. His carton has a drawing of Ned Kelly on horseback holding up a farmer who has a gigantic banana on his cart. It’s class. Ned gave me four of them. Ned also gave me a tour of the packing shed and explained how the whole thing worked. This was pretty special, especially considering I just rocked up out of the blue. Italian by heritage (his father came to Australia and was, like many, originally in cane farming), Ned had the kind of olive skin that goes brown according to temperature as much as exposure to sunlight. The kind of skin I wish I had basically. Despite being physically suited to the climate he said that one never gets used to the heat and humidity in FNQ. There were many challenges to farming bananas, he said with a sort of contemplative pride. I can only imagine, I thought. Ned, like all of the other farmers and their bananas that I met today, was someone I wanted to spend a lot more time with and ask all about their farming experiences and history, all the challenges and rewards. I wanted to ask them what they thought of their place and the landscape and the future, but it didn’t quite seem like the time was right. I needed more of it, basically. Perhaps the Cartonography project can one day provide the time. The space is there. Previous Post Far North Queensland (FNQ) – Day 1. Next Post FNQ Day 3 – Up to the tablelands.